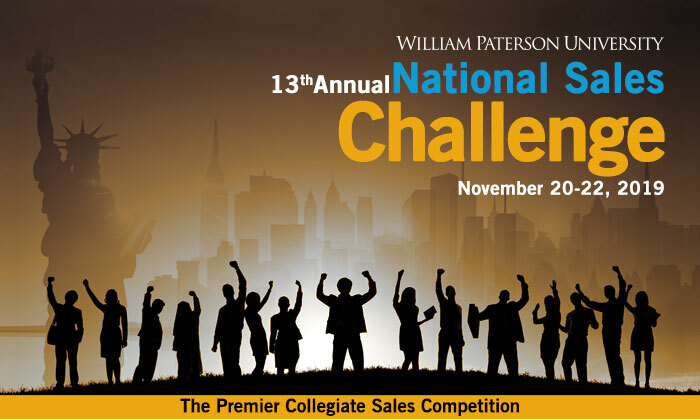 The RBI National Sales Challenge (NSC) is a Premier Collegiate Sales Competition, which is hosted by the Russ Berrie Institute Professional Sales at William Paterson University. International and national sales students compete in this annual event. Corporate companies participate in recruiting and hiring professional sales talent. Our mission is to encourage excellence in sales. We aim to promote the sales profession by providing students the opportunity to demonstrate their skills and capabilities in a series of sales challenges. - Hone students’ sales skills as they gain candid feedback on their sales abilities from corporate executives. - Help students obtain real-world business knowledge and make valuable contacts with executives from a wide range of companies seeking to hire bright new sales professionals. - Allow sponsoring companies to meet and evaluate up-and-coming sales leaders, showcase their organizations, and network with faculty representatives from other university sales programs. Registration for sponsorship is now open. For additional information please contact Lisa Wright at (973) 720-3880. University Pre-Registration will open Spring 2019. Please note that this collegiate sales competition is not affiliated with the National Collegiate Sales Competition and International Collegiate Sales Competition.